Hi Friends! This past year I hosted Thanksgiving at my house which was a perfect opportunity to make some new cute rustic Thanksgiving decor DIY for cheap. Luckily my mom has tons of decorations for everything, so I always borrow what I can. She had the acorn branches, napkins, and pumpkins that I used as name holders. I bought the gold chargers at the Dollar Store along with the leaves and fake flowers. I got some orange burlap in the 50% off remnant section at Joann’s so it only cost a few dollars.
. I cut strips of burlap and frayed the edges a bit and glued them on the jars (click here to learn how to cut burlap easily!). I cut out the letters to spell THANKS twice with my Cricut with card stock and glued those on top of the burlap, front and back (so everybody would see the letters). (If you’d like to check out all the amazing things you can do with a Cricut click here!) Then we added a little ribbon to the top. I arranged different fake flowers in the jars and put it on top of a skinny box topped with some extra fabric so it was sitting above the table. 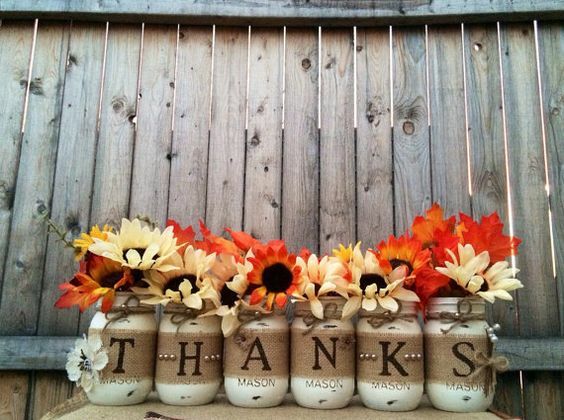 For the DIY Thanksgiving placemats, I got my inspiration from The Wood Grain Cottage. I cut out rectangles from the orange burlap and sewed around every side with white thread about 1/2 inch from edge. Then fray the edge down to the thread. Let the paint dry and then peel off and enjoy the beautiful, easy, and cheap place mats! You can find the full tutorial from The Wood Grain Cottage here. Or you could use iron on vinyl and press them on (click here for my tutorial on how to apply HTV to burlap). My daughter wrote everyone’s name on a leaf and we attached with ribbon to a plastic gourd/pumpkin and put that on top of the napkin. You can find a tutorial on how to fold the napkins in this pretty pattern here. We played a few table games that were a lot of fun for everyone! Click here for a FREE printable of a great Thanksgiving game focusing on WHY you are thankful for things. Also find a roundup of my favorite Free Thanksgiving table games here!! I also decorated my mantle with a few of the flowers in the wooden box along with some beanie baby turkeys! Check out my tutorial here on how to make a wood box and click here for my tutorial on making the foam board art work! Want to save these ideas for later? You can Pin it now if you like!